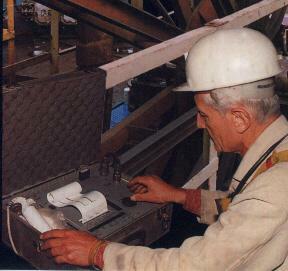 high-end instrumentation with strip chart and/or computer recording which is capable of estimating loss of metallic cross-sectional area and localised losses, and features the real aid to determine true deterioration of the rope. The first of the above categories is less expensive than the second and the instruments are simple tools, mostly hand-held. This kind of instruments makes visual examination of the rope more convenient and reliable. Sometimes, like Meraster MD-20 Tester, they are equipped with a recording signal output which allows their application as sensing heads for detailed inspection of the rope. The second category of instrumentation is intended to perform detailed tests. In conjunction with visual examination they may be applied to determine the moment when the rope should be discarded. Generally this instrumentation consists of two units: a sensing head; and a signal processing/recording instrument. Sometimes the signal processing part and a standard chart recorder are supplied as separate units. Now some suppliers offer portable computers and software for use instead of chart recording. Detectability of rope defects depends mainly on the sensing head employed but readability of its signals and ease of operation depend mainly on recording/processing instrument. The sensing head brings the running sector of wire rope to the condition close to magnetic saturation and provides signals from its sensors. All reputable manufacturers employ a minimum two-channels sensing system: one to detect localised losses ("local faults" LF), e.g. from broken wires and pitting corrosion; and the other one to detect the distributed loss of metallic cross-sectional area ("loss of metallic area" LMA or "total change of metallic area" TCMA) due to corrosion, wear and abrasion. Some types of Polish-made heads are equipped additionally with a third channel to estimate the depth inside the rope of a localised loss position. Detecting capabilities of sensing heads vary between manufacturers and rope constructions. They depend on strong magnetisation capability, shape of magnetic concentrators in the sensor and operating principle of the sensor. In order to measure running rope length (and speed of relative movement), some manufacturers supply heads equipped with special transducer for indicating rope/head movement as an electric signal. Some manufacturers use it to synchronise the strip chart feed with the rope/head travel. This signal is also useful to compensate the speed influence on the inductive coil signal. Processing electronics depends on the sensor types and equipment features. For example the Hall generator sensor requires supply control and compensation of DC component of its signal, and the inductive sensor signal needs rope speed compensation to achieve good performance of the instrumentation. Some instruments have additional circuits that make them more convenient in use, e.g. rope length/speed measuring circuits. A strip chart recorder seems to be indispensable in each fully functional wire rope NDT instrument, as a third part of an instrumentation set, or integrated with the electronic processing part of the equipment. Mostly, manufacturers of these NDT instruments use standard, stand-alone or OEM unit recorders. Generally, it is a two-channel analogue pen recorder or digital thermal array printer. A recorder appropriate for this sort of application must be equipped with drive control to achieve good correlation between the recording and the wire rope at any non-controlled rope speed in the test speed range. The recording should be performed at real time mode, instantly. Meraster suplies extremely task dedicated recording instrument, the MD120 Defectograph. Meraster as one of a few world manufacturers of instruments for rope deterioration estimation in situ, has supplied these instruments world-wide since 1979. Instruments operation principle is based on permanent magnet method, mentioned above. This is an original Polish method developed by scientists of the University of Mining and Metallurgy (AGH) in Cracow (Kraków). At present, the Meraster NDT standard product line includes a full range of sensing heads for ropes in the range 8-90 mm diameter, specialised recorder-defectograph, and a hand-held tester-detector and accessories. In addition, specialised computer software is supplied as an extension of the defectograph capabilities. Moreover, some non-standard and custom-design products are available, for example: submersible heads, heads for other sizes of ropes, telemetry adapters, rope production monitoring systems. Based on many years of experience, and as a result of recent technological development a new task dedicated recording instrument has been designed in Meraster. Up-to-date microprocessor techniques and recording methods were applied to achieve a new quality of NDT procedures. The first model of this instrument was introduced in 1994. Since this date MD120 has been supplied to rope experts in Poland and around the world and it has been recognised as an valuable state-of-art instrument. For example the world famous German testing organisation TÜV Bayern-Sachsen has purchased our equipment based on MD120 unit. automatic set up after entering the specific rope code ("settings + rope code" memory). one channel of integral of the main inductive sensor ( inner coil ) signal, for detecting the totalled "localised losses" along a rope sector. set-up of integration range in instrument according to rope discard criteria "number of broken wires in any x diameter length" allows indicating total losses in appropriate rope sectors lengths. Our old instruments operated with a less convenient "cyclic integration" on a set rope sector. The new instrument operates continuously, in the "running integration" mode, where integration is being performed on a length in the next rope sector. The instrument is recording current values of the integral ( total of losses) of previous rope sector, last "x" metres length. If the length of integration range is set appropriate to discard criteria, it gives direct readable indications of rope sectors in which the number of broken wires probably exceeds value of the discard criteria. During the rope NDT procedure performed in-situ, audio-alarm and "Zoom Replay" capabilities are useful. The Defectograph generates the audio-signal when the pulse value in the "localised losses" channel has exceeded preset alarm level. When a significant rope defect has been observed during recording, the user can stop the rope (or head) movement and recording of readings, and then may replay a previous recording in the zoom mode. Defect position may be read out precisely and found in the rope. Visual examination of the rope sector in question should then be made, additionally. Solid state memory is an option. This is a credit card size S-RAM IC Memory Card conforming to the up-to-date standard, Personal Computer Memory Card International Association (PCMCIA) standard. PCMCIA cards are compatible with many notebook computers. Also PCMCIA slots can be added to most of personal computer systems. In certain rope NDT conditions (subject to magnetism and dirt) and to improve operating conditions, this method of data transfer has many advantages. For example: PCMCIA Memory Cards feature: ruggedness, magnetic field proof principle of operation and fast interfacing. With this option, the Defectograph may store additionally an all-rope test record in the memory card. Capacity of the recording depends on the card version, e.g. 1 MByte card can storage test of a rope of 600 m in length and 4 MB - 2400 m. Then data may be sent easily and quickly to a computer via the PCMCIA slot. This way, the user can archive many test records for further comparative analysis and can employ graphical, scientific software to help him in his work on rope test results. Also data from Memory Card may be replayed on a strip chart with an MD120 Defectograph, including old test records from computer storage memory. S-RAM cards are erasable, for multiple use. The recorder prints automatically the number of annotations on strip chart, e.g. rope length in metres, every 5 cm of a chart, a rope code set by the operator; recorder settings, direction of movement, date and time. Before a rope test, the user can enter into the instrument a specific identification code which will be printed on the chart, and test settings like channel sensitivities will be stored with this identification code in non-volatile memory in the instrument. If the same codes are entered in future, the same settings may be applied automatically. The recorder may operate in one of two main modes: chart feed synchronous to rope movement; or chart feed at constant selectable speed. Recording is done by means of a thermal array line printing on thermal paper . All of the instrument settings and measured values are displayed on a liquid crystal display. Any instrument setting may be changed with one only knob-push-button. The instrument is designed for field service. Built in aluminum covered case with handle, the MD120 Defectograph is easy to carry. MD120 operates from a built-in rechargeable battery or various external power sources, AC or DC. Automatically microprocessor controlled recharging while external power is connected is provided. 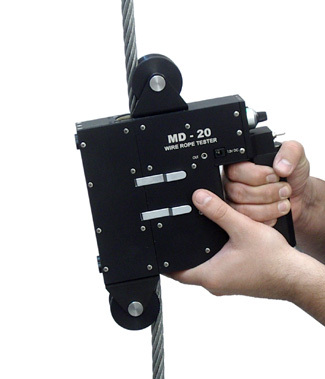 Field service and user-friendly oriented functionality of the MD120 in conjunction with its capability of computer aided post-testing analysis make this instrument useful as well as every-day tool for rope expert and as a source of data for scientist. Easy access to the test records with computer software tools seems to be a real aid to make faster progress in the development of rope evaluation methods.